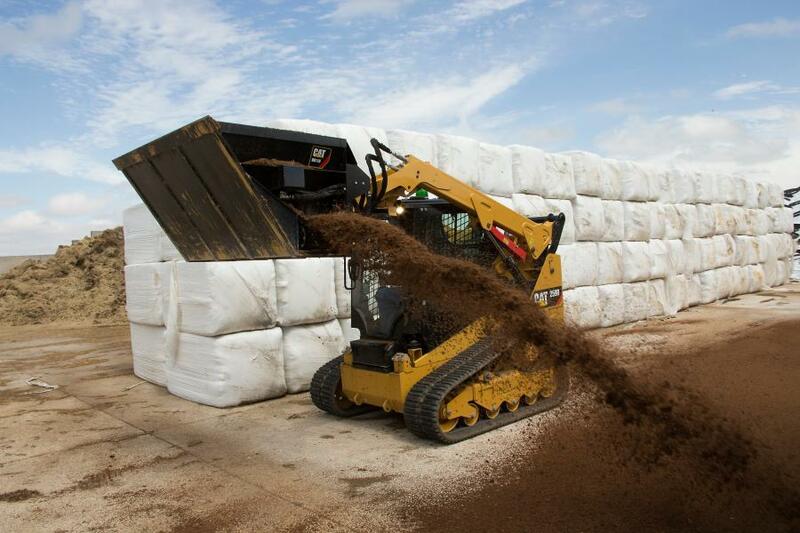 Cat side discharge buckets — designed for use with skid steer loaders, multi-terrain loaders, compact track loaders, and compact wheel loaders — collect and transport loose materials such as sawdust, sand, mulch and topsoil and then discharge these materials via a belt-type conveyor from adjustable openings (doors) on either side of the bucket. 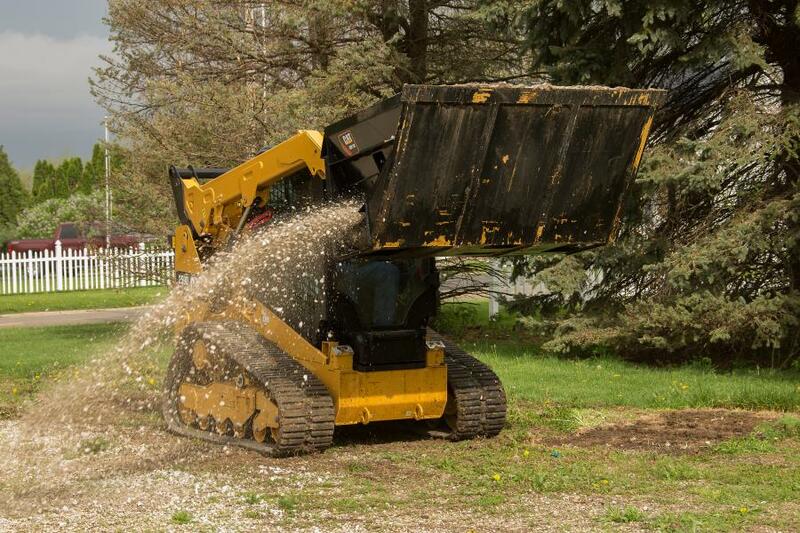 Cat side discharge buckets — designed for use with skid steer loaders, multi-terrain loaders, compact track loaders, and compact wheel loaders — collect and transport loose materials such as sawdust, sand, mulch and topsoil and then discharge these materials via a belt-type conveyor from adjustable openings (doors) on either side of the bucket. A rotating agitator works to keep material flowing to the conveyor. Adjusting conveyor speed and door openings controls the volume of material discharged and the area covered. Features of the Cat side discharge bucket suit this attachment for varied application, including agriculture, construction, landscaping, road maintenance and material handling. The rubber conveyor belt — featuring a heavy duty, raised chevron tread design and equipped with an adjustable tensioning device — is engineered for long-term durability and functions efficiently whether discharging material left or right. Two externally mounted, reversible, hydraulic motors power the conveyor directly, eliminating any intermediate drive mechanisms. Specially designed openings in the bucket floor allow any material remaining in the bucket to escape, preventing material build-up beneath the conveyor. 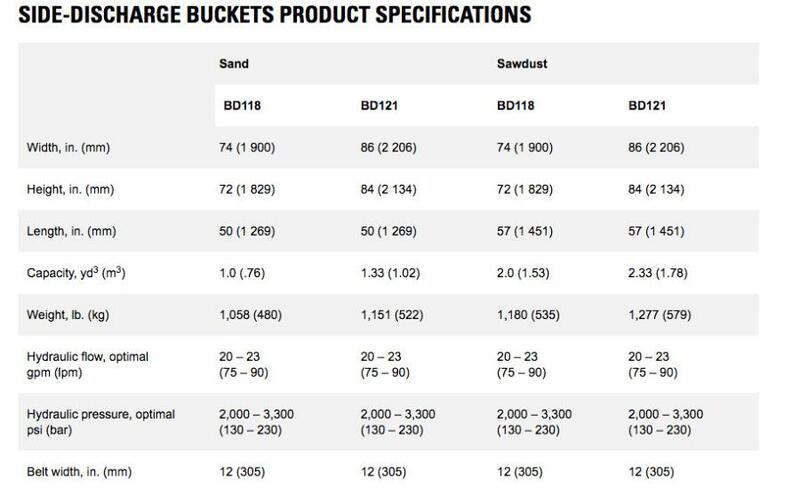 Side discharge buckets designed for consistent use in sand, or other heavier materials, feature an internal baffle to reduce belt strain. The agitator assembly, directly powered via a third, high-torque hydraulic motor, functions to reduce material bridging in the bucket to ensure consistent material flow to the conveyor. Agitator paddles are available in sand and sawdust configurations, the sand style featuring a straight design that exerts added force to push through dense material, and the sawdust type featuring an aggressive design that uses prongs to assist in breaking up material and reducing weight on the conveyor. The manually adjustable discharge doors, one on each side of the bucket, regulate the volume of material discharged. The doors are built with thick-plate reinforcing for durability. As an added safety feature for Cat side discharge buckets, a welded, serrated step facilitates entering and exiting the cab. For more information, visit www.cat.com.